MAC’s Mineralize Skin Finish Natural gives my liquid foundation a beautiful matte finish that lasts for most of the day. It also blends well with my skin tone, covers up all my blemishes and doesn’t feel heavy on my skin. I’d say this is by far the best I’ve ever used! I bought myself this product a few months ago, I have the soft and gentle shade and i love it! I use it as a highlighter on my cheekbones,above my brow and then down my nose, it works great and gives you a healthy glowing finish. It is a bit pricey but i will definitely purchase it again, this is the best highlighter that i have used!! It also lasts the whole day keeping you fresh faced and glowing! I love this product! It blends easily into my skin. I used it by itself for a natural finish or over mineralize foundation for a full make-up effect. It leaves a subtle finish on the skin and gives a very natural looking glow. It is very effective in banishing shine without leaving skin looking dull and lifeless. 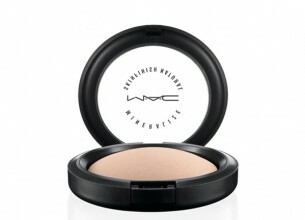 I have so many MAC products, but honestly I can’t leave home without applying this skin finishing powder. It leaves a matte look and completes your make-up process. It locks in all the make-up, and leaves your skin looking flawless and supple with a matte finish! I would say if you are buying the concealer and/or foundation, definitely buy this to give it that finished flawless look! This product is just great for setting your foundation. It gives me a flawless and matte finish. It’s long wearing and the packaging is small, the perfect size to pop it in your bag for a touch-up throughout the day. I recently started using this product over my foundation and I absolutely love it! It gives me a perfect matte finish and it lasts all day! I’ve also noticed that if I apply a little extra under my bottom eyelid, my eyeliner doesn’t smudge throughout the day.